Solanum Tuberosum (Potato) Starch (40-50%) (and) Water (10-20%) (and) Squalane (10-20%) (and) Limnanthes Alba (Meadowfoam) Seed Oil (5-10%) (and) Hydrogenated Lecithin (5-10%) (and) Xanthan Gum (1-5%) (and) Tocopheryl Acetate (1-5%) (and) Phenoxyethanol (0.1-1%). Biomethics® CPS O/W by The Innovation Company acts as an O/W emulsifier for either cold or hot processing. It is recommended for formulations designed for dry and sensitive skin types. It functions as a barrier against moisture loss and protection against external irritants. It provides excellent skin feel and softness. It is surfactant- and PEG-free. It is compatible with both physical and chemical UV-filters and can boost the SPF results. It provides an even application with Titanium Oxide. 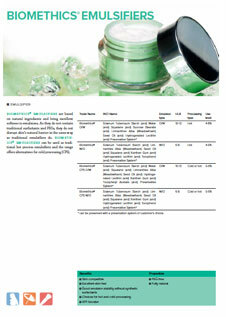 Biomethics® CPS O/W is used in skin-care, sun-care and color-care (foundations, highlighters and make-up primers). It has a shelf life of 3 years.